Glaucoma is the second-leading cause of blindness in the United States. The condition usually occurs when pressure in the eye, called intraocular pressure or IOP, is too high. The high pressure damages the optic nerve, thus preventing proper transmission of visual information from the eye to the brain. And unlike cataracts or corneal opacities, once vision is lost from glaucoma, it is not recoverable. Open-angle glaucoma is the most common type. It affects almost 3 million Americans, afflicting men and women equally. But women are 2-4 times more likely than men to get a more acute and more dangerous form called closed-angle glaucoma. People of Asian decent are also at higher risk for closed angle or narrow angle glaucoma. African Americans are at the greatest risk, and according to the Glaucoma Research Foundation, African Americans can expect it to show up earlier and progress faster than in other ethnicities. And if you have a sibling who has been diagnosed with glaucoma, your risk of getting the same diagnosis increases by a factor of 10! At Roholt Vision Institute, advanced technology like this three dimension rendering of the optic nerve assists the doctor in evaluating the health of the optic nerve. Any of the aforementioned risk factors are an important reason to be checked regularly. Glaucoma is called “The Sneak Thief of Sight” because it does not have any symptoms until the end stages of the disease and the damage is not reversible. Fortunately, detection has progressed a great deal over the past several decades. We no longer need to wait until peripheral vision has been lost to diagnose glaucoma. 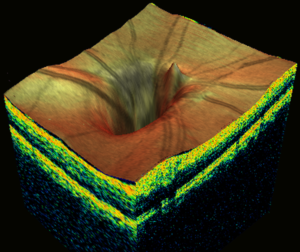 New technologies allow for detection of early changes in nerve tissue within the retina. This allows for earlier detection and therefore, a better long-term prognosis for keeping a person’s vision for his or her lifetime. According to Dr. Brian E Mathie, Clinic Director for Roholt Vision Institute, “In almost all cases, severe vision loss from glaucoma is preventable. With the use of advanced technologies, we can detect it up to 10 years earlier than in years past so the biggest hurdle in most cases is simply getting patients to be examined by their eye care professional so that appropriate and effective treatments can be initiated”. At RVI, we have advanced technology that measures the functional and structural status of the nerve that can be damaged in glaucoma. These extremely accurate devices quantify the amount of healthy tissue to the thousandth of a millimeter and can also analyze changes that may occur from one year to the next. Colored graphics demonstrate areas of normal nerve tissue (green), borderline (yellow) and abnormal (red) for all areas of nerve tissue in the center of the retina and surrounding the optic nerve. By comparing these values to expected norms for patients of a given age, doctors at Roholt Vision Institute can determine a relative risk for glaucoma for each individual patient. 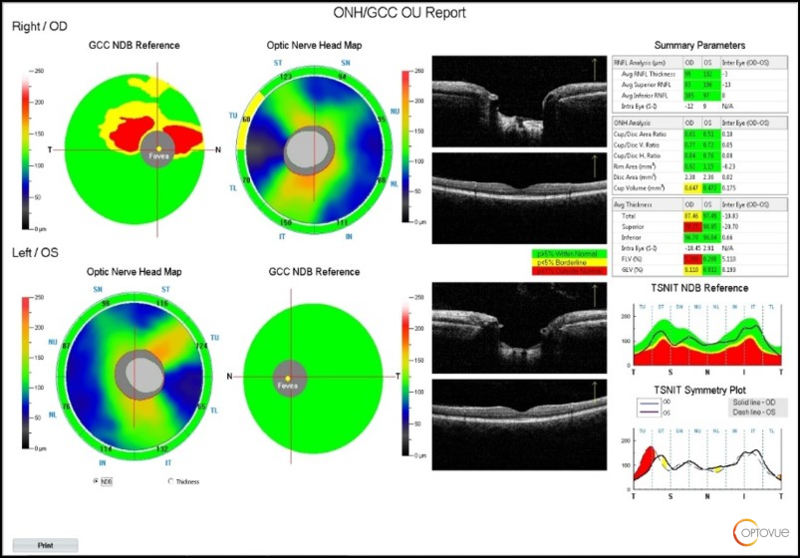 Being able to measure the exact values of healthy nerve tissue over time is the most important aspect of monitoring glaucoma for progression or worsening of the disease. State of the art technology allows Roholt Vision Institute to evaluate each exam for any changes in the nerve tissue, however subtle they may be. Scheduling an eye exam to evaluate the intraocular pressure and the health of the optic nerve is important for each and everyone one of us, but especially important for people who have risk factors such as a family history of glaucoma, African Americans, the elderly and anyone who has a history of elevated pressure in the eye. Unfortunately, there are not any warning signs or symptoms for glaucoma, so it is very important to get checked on an annual basis. This is especially true for patients who have risk factors, such as having a family history of glaucoma, being African American, having a history of high pressure in the eyes, being diabetic or having a history of trauma to the eye. How is RVI any different in testing and monitoring glaucoma? 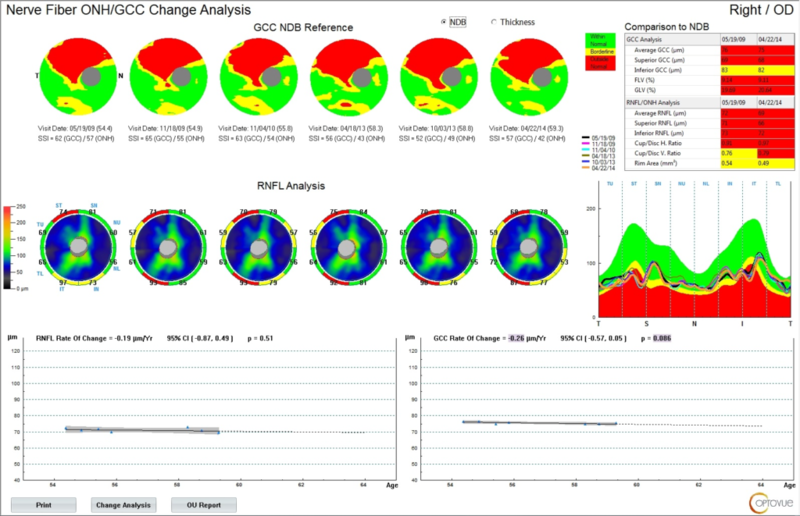 RVI has made a major commitment to the utilizing the best technology for diagnosing and monitoring glaucoma. In this way we can diagnose it earlier than what was previously possible, and with an early diagnosis and appropriate treatment, healthy eyes and full vision can usually be maintained. What options do I have once I am diagnosed? Medications, lasers and surgical procedures are all treatment options that are available through RVI. These treatment options will be discussed with you to see which will be best to achieve our treatment goals and work well with your lifestyle. Unfortunately, there is no cure, but it can be effectively treated. But much like treating high blood pressure, if you stop taking your medication the pressure can rise again. Will I go blind if I am diagnosed with glaucoma? In most cases, no. Currently there are numerous effective treatments to prevent further vision but if left untreated, glaucoma can certainly lead to blindness. What new treatments are available for glaucoma? RVI incorporates the newest medications, laser treatments and MIGS (minimally invasive glaucoma surgery) to effectively treat glaucoma. Excellent advancements in the treatment options has led to improved results in treatments. Roholt Vision Institute proudly provides patients from North Canton, Canfield, Alliance OH and surrounding areas with glaucoma treatment. Contact us today to schedule an appointment!